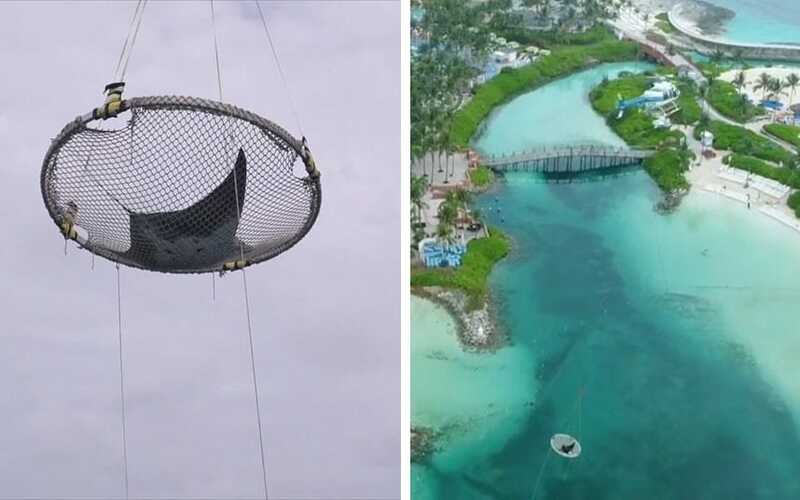 Recently FairLifts assisted with a Manta Ray airlift at the Atlantis, Paradise Island Resort. The giant manta ray was tagged and relocated as part of the research program with Mote Marine Laboratory. The large manta will be released to study the animal’s migration patterns. The animal airlift was scheduled for June 15th to lift the 700+ pound manta ray to the ocean after marine experts had successfully tagged the animal, affectionately named “Leyley”. The species has been listed as vulnerable by the IUCN (International Union for Conservation of Nature) as threats of pollution and overfishing have impacted their numbers. Mantas are quite large making the study of their behavior difficult in most areas which is why there are so few aquariums caring for them. Not to mention the difficulty being in their transport, which is why a helicopter lift was needed in Leyley’s release. The Atlantis, Paradise Islands resort is one of only two locations in the Western Hemisphere, the other being the Georgia Aquarium, studying and housing the gentle ray. There are only three facilities in the world housing and researching them. The way in which FairLifts assisted with the manta ray airlift was to locate an experienced and safe operator in the area who could facilitate the airlift in the safest way possible. With a team of 21, a marine biologist and 20 marine aquarists, the transfer of Leyley to the helicopter lifting net was completed as a part of their world renowned release and research program in partnership with Mote Marine Laboratory. At approximately 7:50 a.m. as reported by Atlantis in their linked press release, Leyley was tagged, given a medical exam and blood sampling by Atlantis’ own veterinarian Dr. Robert Hueter, Senior Scientist at Mote Marine Laboratory in Sarasota, Florida. She was gently transferred using a hand-woven net across a custom-engineered frame designed to withstand the weight of a manta. The helicopter then carefully raised the net using a hydraulically welded frame. In total, the transfer took 105 seconds from lift-off to her safe placement into the Atlantic. Since 2011, mantas have become strictly protected in international waters after their inclusion into the Convention on Migratory Species of Wild Animals (CMS). The organisation works to conserve migratory species and their habitats globally. The program in which the resort works with Mote focuses on the careful study of the mantas in captivity as well as once released. Leyley will be tracked using Mote’s tag and the data will be sent back to be studied by researchers, educators and biologists in the hopes that they can understand more about these mysterious creatures.